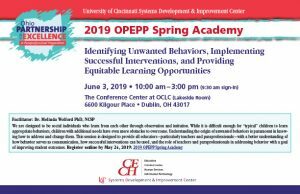 The University of Cincinnati Systems Development & Improvement Center is pleased to host the OPEPP 2019 Spring Academy, Identifying Unwanted Behaviors, Implementing Successful Interventions, and Providing Equitable Learning Opportunities on June 3, 2019, at The Conference Center at OCLC (Lakeside Room). This interactive session is designed to provide all educators–particularly teachers and paraprofessionals–with a better understanding of how behavior serves as communication, how successful interventions can be used, and the role of teachers and paraprofessionals in addressing behavior with a goal of improving student outcomes. There is no cost to attend, lunch will be provided, and all district and school personnel are invited.